Putting the Kids in the driving seat! These are the only childrens electric go-karts to hire in Basingstoke! If you are looking to give your Children a Birthday Party to remember then look no further!! Bounce 4 Fun Go-Karting will delight your kids with their first real driving experience. We offer fun parties for children aged between 3 & 10 years. Each child must be under five foot tall to participate. We provide two supervisors, an inflatable track measuring 15 metres by 11 metres and four battery powered Cub Karts, which can run on almost any surface indoors or out. After a few a laps of practice we add more fun by organising a mini grand prix. Birthday parties are drawn to a close with the presentation of certificates for all participants & a medal/trophy presented to the birthday boy or girl. Bounce 4 Fun go-karts can be speed restricted from 1mph - 6mph. Our karts have been designed and built for the safety and comfort of children. They have many safety features including adjustable padded seats, safety belts, padded steering wheels, space frame chassis incorporating padded roll bars, integral rear bumper, side guards and many more. We are also available to attend shows, fetes, fairs, sports days, holiday venues, school fun days, corporate events, charity events, shopping centres or any other function or event you may hold. Our go-karts can be set up anywhere and they will not mark polished floors or cut up grass. If space is an issue then please contact us for information on halls to hire in the local area. 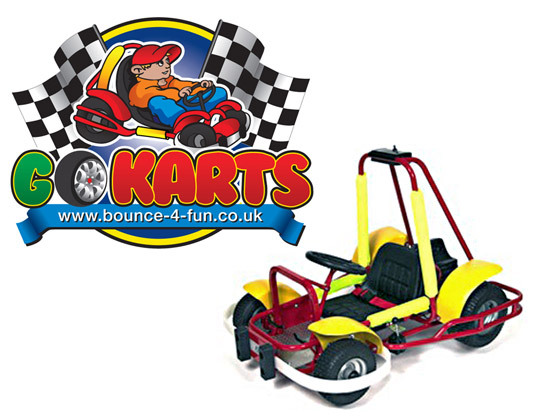 Bounce 4 Fun Go-karts are only for the use of children from the age of 3 to 10 years. Each event is supervised by our staff who are trained in the use of and all safety aspects of the Cub Karts. The karts are set to low speeds initially until the children’s confidence levels are up. The speed can be restricted from 1mph - 6mph. The inflated circuit can gently absorb any accidental contacts. Our karts are also enviromentally friendly, there is no noise or polution. Bounce 4 Fun Go Karts are designed and built for commercial use, these are not TOYS! Only available to hire at Bounce 4 Fun!